Remember my blog about the 2 academics, Chris Gibson and Andrew Warren, from the University of Wollongong, NSW, and their research around forestry and the guitar manufacturing business? Well here’s a great article about their research. It’s much easier to read than their academic papers. The two videos are especially enjoyable and informative. Unfortunately we still haven’t got the tonewood narrative going back to the tree growers yet. It is still about the players, the makers and the sawmillers. The trees just magically exist in the current narrative. Where are the people planting and managing these tonewood resources? Back in July last year I wrote about two academics from The University of Wollongong, NSW (Chris Gibson and Andrew Warren) who came down to Tasmania as part of a project they are working on concerning the guitar industry and its response to changes in the tonewood market. They have now published a second paper which looks specifically at the Australian industry and its use of Bunya pine (Araucaria bidwillii). Once again like the first paper, this is not an easy paper to read, containing dense academic text. Being a forester I was already aware of the history of Bunya pine, and the trial plantings made by the Queensland Government in the early to mid 20th century on public land. New to me was some of the history about the use of native timbers in the local guitar industry, particularly Maton and Cole Clark. Bunya pine is a major sound board tonewood for these two companies. But the article makes clear that both these companies are now relying on the old Government Bunya trials for their supply, and the future of those trials is clearly subject to the whims of political fortune. The pressure to clear the Bunya trials and replant with the faster growing more profitable Hoop Pine is always there. Future Bunya tonewood supply hangs by a thread unless alternative supplies can be established. Maton and Cole Clark are clearly struggling to secure and control their future tonewood supply. It’s a complex and difficult challenge. Not the least of the challenges is that Bunya takes 60+ years to reach a size that allows soundboards to be sawn from the logs. Unfortunately the article provides few clues as to how the problem can be resolved. Long term thinking and commitment is needed. Both of these companies appreciate that relying on Governments for their timber supply doesn’t work. What we need here is a business model that encourages farmers/landowners to plant tonewoods for both commercial return and non-commercial planting. This will involve the collaboration and support of many players, especially Maton and Cole Clark. These companies are too small to have the resources to grow their own tonewoods. Perhaps a “Tonewood Alliance” is needed to get the ball rolling? Here’s a great new video from Cole Clark Guitars about their use of Australian grown timber. Cole Clark is breaking all the rules and for that they must be congratulated! Faced with a diminishing supply of traditional tonewoods, Cole Clark is challenging the marketplace and looking towards a sustainable future. Their use of non-traditional, and especially the use of fast-grown woods for soundboards, is revolutionary. At the moment Cole Clark are trialling these woods from salvaged planted trees, of which this video tells a great story. Cole Clark is also a big user of farm-grown Tasmanian blackwood. So if you are looking for a sustainable guitar Cole Clark is a good option. Check them out. Eventually I hope Cole Clark will take the next step on the road to sustainability and promote farm-grown tonewoods. It’s all about the farmer! Some good news for a change from the usual political/forest industry dramas. 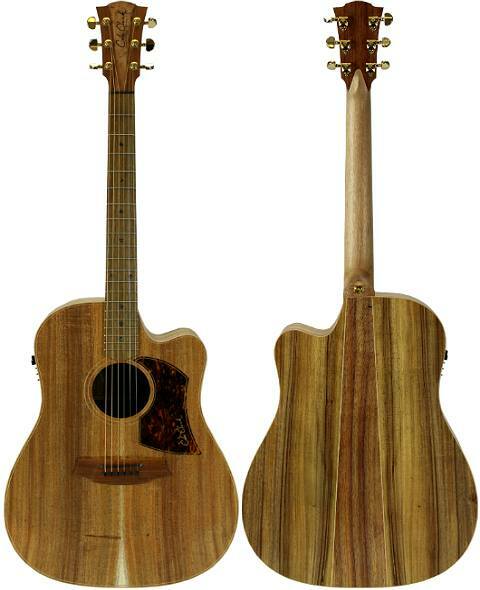 Melbourne-based Cole Clark guitars have just announced their all-Australian Eco series. “These new models feature 100% sustainable timbers by replacing endangered timbers with sustainable Australian substitutes“. Farm-grown Tasmanian blackwood features prominently in the series. For those wanting to avoid rainforest timbers these are a great alternative. The idea of an all-Australian commercial guitar has finally become reality. Now the next step is to get farmers to actually start to plant and manage these timbers. I suspect most of these timbers are salvage logged rather than the result of active management. Cole Clark is the “outsider” of the Australian commercial guitar world. They are new(-ish), innovative and untraditional. In this age when the acoustic guitar market seems to go from strength to strength, makers are exploring everything new and everything old in order to supply the ever-growing market. All-mahogany and all-koa guitars were popular in the 20’s and 30’s, and they have recently made a big comeback. So the idea of an all-blackwood guitar seems pretty straight forward to me. It should become an Aussie classic model! But until recently they have been one-off custom makes. Now Cole Clark of Melbourne is offering a range of all-blackwood models. This is farm-grown Tasmanian blackwood! They are quite understated in appearance, which to my mind fails to capitalize on blackwoods natural beauty. But it’s a great beginning. I hope they sell well. Here’s a recent review by Cranbourne Music. I hope one day to write a story that begins at the farm and finishes with the performer/artist. That would be a great story!